The 1918 influenza pandemic that killed between 20 million and 100 million people world-wide was unusual in a lot of ways. One of the most extraordinary things about it was not just the high mortality rate, but the mortality pattern. 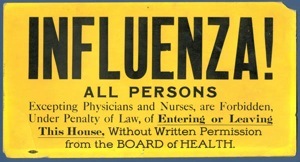 Normally influenza kills the very old and the very young; but the 1918 flu killed young adults as well — people in the prime of life, who normally are highly resistant to death from influenza. 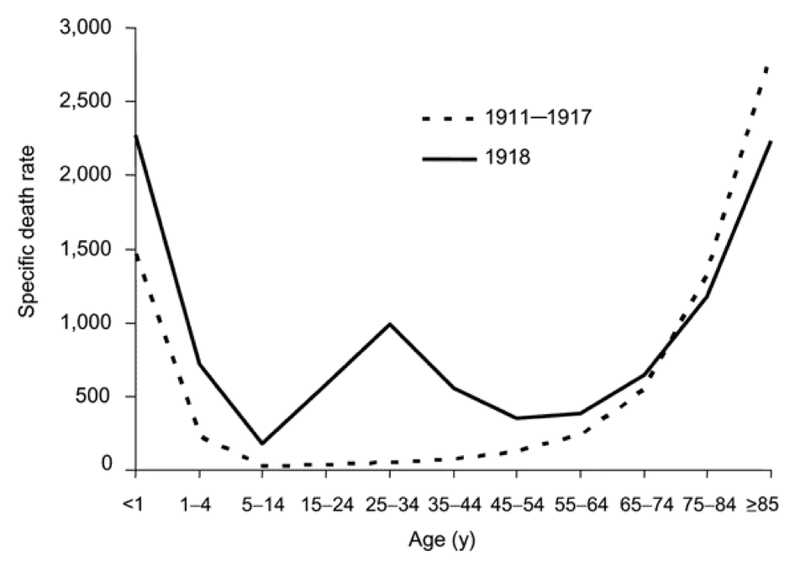 The famous graph below1 (click for a larger version) shows this; the dashed line is mortality vs. age for “normal” influenza outbreaks (the “U-shaped curve”), and the solid line shows mortality vs. age for the 1918 flu (a “W-shaped curve”). There are two ways to look at the W-shaped curve. You can either ask, Why did the young adults die? Or you can ask, Why did the older adults NOT die? In other words, was there something that protected the older adults that the younger ones didn’t have? One explanation (and I can’t find the original paper to give credit) is that somewhere around 1870-ish (that is, 45 or 50 years before 1918) some other influenza strain infected the population, and gave a little bit of cross-protection against the 1918 strain. People alive in 1870 were exposed to this (hypothetical) strain of virus, developed immunity, and fifty years later were protected against the 1918 strain.2 Of course, supporting this idea is the recent paper3 that received a fair bit of attention, showing that survivors of the 1918 pandemic still have specific immune responses to that virus, 90 years later — so certainly immunity could last fifty years. One of the problems with influenza vaccination, of course, is that the virus changes. New strains arise and mutate, and the vaccines have to match the major circulating virus pretty well. Antibodies against one major strain of influenza don’t do a good job against a shifted strain. We see this is the paper I just mentioned — hardly anyone younger than 90 responded to the 1918 flu, even though they had been exposed to influenza viruses (of different types) every year for up to 80 years. It would be nice if there was a vaccine that gave resistance to many strains of influenza, and we didn’t have to develop new vaccines ad hoc each year, based on imperfect guesses as to which viruses will circulate six months in the future. What’s more, we don’t really have good vaccine strains for novel influenza strains — like, say, whichever strain of avian influenza eventually succeeds in making the jump to humans. Our present vaccines against flu are designed to raise protective antibodies. Antibodies in general target the outside of the viruses, which are intrinsically variable; hence the need to customize the vaccine strain with the circulating strain. Cytotoxic T lymphocytes, on the other hand, at least have the potential to target internal components of the viruses, which may have different constraints and therefore not be able to change as much. Could these CTL be more cross-reactive than antibodies? 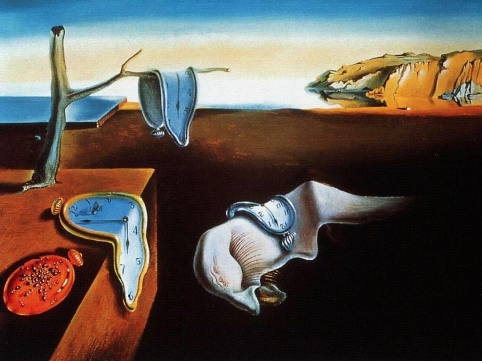 It turns out that, yes, CTL are quite cross-reactive. A paper from Tao Dong’s and Sarah Rowland-Jones’ lab4 looked at anti-influenza T cells from normal volunteers (who had, of course, been exposed to the usual influenza A strains that sweep around the world each year). Memory CD4+ and CD8+ T cells isolated from the majority of participants exhibited human influenza-specific responses and showed cross-recognition of at least one H5N1 internal protein. If the T cells that are normally present are partially protective, could they be cranked up to offer more protection? For example, what if vaccines (as well as triggering antibody responses) also tried to boost these cross-reactive memory responses? Potentially, this could lead to people who have long-term resistance to many influenza viruses, avoiding the need for annual re-vaccination, as well as having immunity to new influenza viruses that aren’t otherwise covered by the vaccinations; such as avian influenza.